Christopher Columbus (1451-1506) - The man who bridged the "Old" and "New" worlds, Christopher Columbus (Christóbal Colón in Spanish) forever changed the course of human history through his trans-Atlantic voyage in 1492. To be sure, he was not the first European to sail to the Americas. That distinction (as far as we know) goes to Leif Ericson who reached Newfoundland almost 500 years earlier. But it was Columbus' voyage which initiated the Age of Exploration. It is also seen as a bridge between the Middle Ages and the Early Modern Period. Interestingly, Columbus' expedition was likely precipitated by another major event from that era. The Fall of Constantinople (see below) at the hands of the Ottoman Empire cut off the Silk Road trade route to Asia, and European countries began searching for alternate routes by sea. The two events together effectively ended traffic along the Silk Road. Columbus was born in Genoa, an independent city-state in present-day Italy. Even though Genoa, like Venice, was a maritime power, he did not sail to the New World under a Genovese flag (of course, Genoa was in decline in Columbus' time due to its long wars with Venice). In fact, Columbus spent many years lobbying several countries to fund a voyage west across the Atlantic Ocean. The first was Portugal in 1485. King John II expressed serious interest in granting Columbus the ships and funds to sail, but his advisers rejected the idea claiming Columbus seriously underestimated the distance required to reach Asia (which he did). Shortly after, Portuguese explorer, Bartolomeu Dias, successfully sailed around the southern coast of Africa (Cape of Good Hope), opening an eastern sea route to Asia, and King John was no longer interested in Columbus' proposal. He went to the Genovese and Venetian governments, but they turned him down. His brother, Bartholomew, went to England to inquire of King Henry VII; but coming off the conclusion of the Wars of the Roses, the country was in no position to fund an overseas voyage. Columbus first approached Ferdinand and Isabella in 1486, but Spain was in the midst of a war with the Muslims of Al-Andalus and could not afford to fund such a campaign. But in January 1492, the last remaining Islamic stronghold fell (see Fall of Granada below), and the Spanish monarchs were ready to discuss Columbus' proposal. Apparently Isabella dealt with Columbus alone because initially she turned him down, but Ferdinand evidently intervened and overruled the queen. Columbus was said to be leaving the capital on a mule feeling dejected, when a guard caught up with him and beckoned him to return. Spain agreed to fund half the enterprise; the other half came from Italian merchants which Columbus already had lined up. Ferdinand and Isabella pretty much agreed to all of Columbus' conditions because they didn't really expect him to return. On August 3, 1492, Christopher Columbus departed from Palos de la Frontera with three ships; the Niña, the Pinta and the Santa María (the Santa Maria being the flagship). 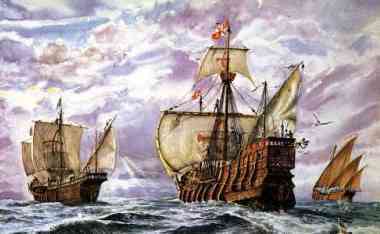 After provisioning in the Canary Islands, they set sail on the open sea on September 6th. On the morning of October 12, after five weeks, land was spotted. 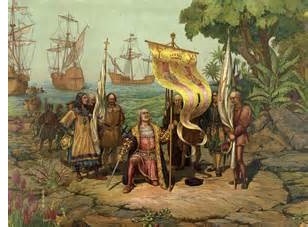 Columbus set foot on San Salvador in The Bahamas. For three months, he sailed around the Caribbean before returning to Europe. Along the way he lost the Santa Maria, left 39 Europeans who founded the settlement of La Navidad in present-day Haiti, and took six natives back with him to learn European languages so they could serve as interpreters in the future. He arrived back in Europe on March 4, 1493 and was forced to dock in Lisbon because of bad weather. One of the first men to speak to him was Bartolomeu Dias, the explorer who sailed around the Cape of Good Hope. Before leaving Portugal, he paid his respects to Princess Eleanor of Viseu, which is interesting because a young Ferdinand Magellan was a page in her court; so he probably met Columbus. After a week, Columbus departed from Portugal and reportedly evaded an assassination attempt by King John II (who probably didn't want Ferdinand and Isabella to take possession of his discoveries) and landed back in Spain on March 15th. He would make three more voyages to the New World between 1493 and 1504. He died in Spain on May 20, 1506. Despite the evidence to the contrary, Christopher Columbus remained convinced to his dying day that he had reached Asia and not a heretofore unknown land mass. This is probably the reason why the two new continents were named for Amerigo Vespucci and not Christopher Columbus.